Wildlife Sanctuary: means an area closed to hunting, shooting or trapping of wild animals and declared as such under Article 23 by the government as undisturbed breeding ground primarily for the protection of wildlife inclusive of all natural resources such as vegetation soil and water (paragraph) (p) of Article 2). National Park: means comparatively large areas of outstanding scenic and natural beauty with the primary object of protection and preservation of scenery, flora and fauna in the natural state to which access for public recreation and education and research may be allowed (paragraph) (p) of Article 2). Special Biodiversity Area: means specialized forest areas to consider for the to conservation and development of biodiversity. For example Ratargul Swamp forest of Sylhet. Vulture Safe Zone: means areas considered for conservation and reproduction of critically endangered white-rumped Vulture (Gyps bengalensis). Ecopark: means an area of natural ecological habitat of flora and fauna with outstanding scenic beauties which is managed for providing recreational facilities for visitors and which is declared as such through official gazette notification under section 19 of the Act. Botanical garden: means an area where different native and exotic plan species are conserved or managed for education, research and conservation and improvement of source of genepool introducing from another habitat and which is declared as such through official gazette notification under section 19 of this Act. Safari park: means an area where indigenous and exotic wild animal species are protected in an approximation of a natural environment for increasing the population and grazing openly and which is declared as such through official gazette notification under section 19. 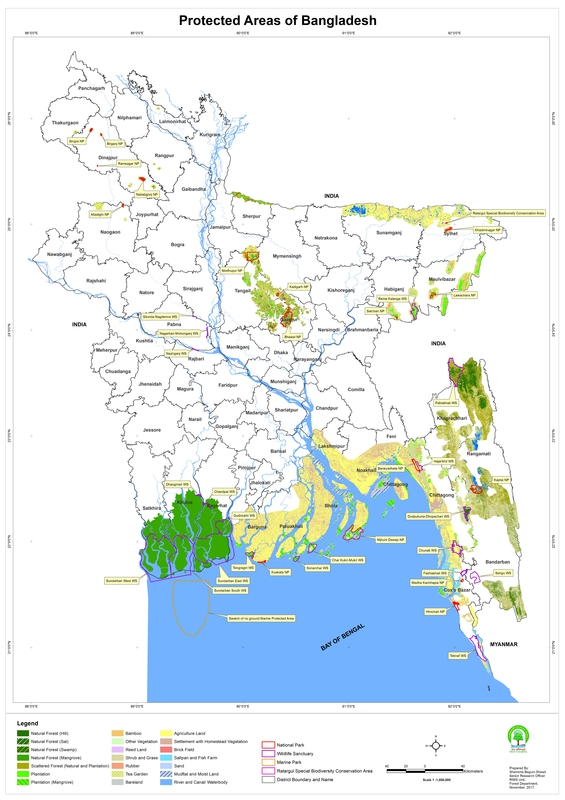 Bangladesh Forest Department is implementing a project titled "Climate Resilient Ecosystems and Livelihoods (CREL)" under the Ministry of Environment and Forests for better management of Protected areas. Follow the below link to see the resources and specific activities conducting in the protected areas.